I’ve never been to a seed swap before. And to be honest, I had no real plans to participate in the one this Saturday at the Good Food Festival. Then I cut open this incredible squash last week. A few years back I visited my friends’ Jenny and Bob at Harvest Moon Organic Farm. One of the tastiest things I ate there was Zephyr squash, picked one minute, sliced and grilled the next. 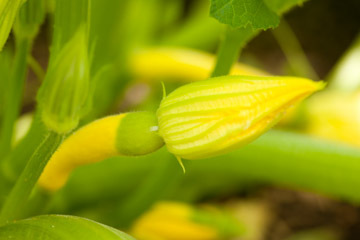 When Ellen and I started gardening, I definitely wanted those beautiful yellow summer squash in our “Albany Park Harvest”. Oddly, there were no organic Zephyr squash seed available. Jenny advised me to buy what I could find, grow them organically and save seed. Going forward I would have organic squash. Going forward I would be squashing Monsanto. Save seed!? What do I know about saving seed? So late last fall we pulled a ginormous Zephyr and set it aside to dry. It turned a beautiful orange color, like a pumpkin, and hardened like one too. We started planting in February – it was high time to harvest and dry these seeds, so I cut it open last week, rinsed the seeds and spread them out to dry. Suddenly, there before me was a lot of seed, a lot of more or less organic hope. Something I could share. Something I could drop on a table at a seed swap. So I folded together these little paper envelopes, feeling very crafty, and carefully labeled them with the seeds’ story. Wow! These humble little guys have a story! As I wrote on the papers, imagining someone picking up my little packets, I felt like I was writing a note and dropping it into a bottle to throw out to sea. 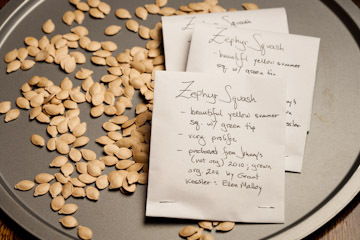 I guess saving and sharing seeds is like that – a little “love note” to someone who chooses them. I want to say to whomever takes them, that beware – they are like all summer squash, so prolific that you’ll be “forcing” them on your friends come August…but that they are also delicious and that some of their relatives are in my freezer as ratatouille and others are in jars on the shelf, a fabulous bread and butter pickle Ellen made. Enjoy them. Share them. And come late fall, set one aside to feed you, and others, the next year. I’m looking forward to my first seed swap.